I freely admit that I know next to nothing about beer. Oh, except that 12 ounces of Guinness is actually less calories than 12 ounces of Budweiser or Heineken (a fun fact to casually toss out when someone says, “I can’t drink stout, it’s too fattening!” Watch their world shatter). So for me, if I’m going to a bar that primarily serves beer, I want to be able to put myself in someone else’s capable hands. In my ‘hood, those hands belong to The Saloon at 12th & U. Long before the Belgian beer craze hit DC (noticing a trend about trends in this town? ), before lines at Marvin, Granville Moore’s, or bibles of beer at Brasserie Beck, there was The Saloon. Billed as having the “most unique selection of beer on tap”, it’s a completely unpretentious spot that will never get ruined, because there’s nothing the least bit trendy about it – it’s a true neighborhood tavern, dependable, honest, with comfortable bare bones and even a social conscience. For years I’ve only gone to The Saloon for dinner, sitting at one of the plain wooden tables, always getting the classic bacon cheeseburger and fries. I’m convinced that The Saloon has the best fries in town, but that’s another story. Because it was the only kind of German beer I remembered consistently, I would order a Hefeweissen (Dunkel or Franziskaner, whichever I felt up to pronouncing). I had never sat at the bar, until last Friday when catching up with a friend the only seats to be had were two cosy corner barstools. Now, The Saloon may be famous (or infamous) for its “No Standing” rule, but personally I think publicans have the right to impose whatever rules they want – it doesn’t bother me and it keeps a certain familial feel about the place. But if that bothers you, along with “No Martinis” or possibly sharing a table with strangers, then it just isn’t the place for you to hang out. Go elsewhere, no worries all round. So it was that we found ourselves in the hands of owner Kamal “Commy” Jahanbein, winner of “Best Enforcer” in City Paper’s annual Best Of earlier this year. I turned myself over to him saying, “It’s your choice, what do you think I should try?” He started me off with an Eggenberg, and then introduced me to the joys of Spaten Optimator, a dark Bavarian beer that’s (to my untrained palate anyway) slightly sweet, malty, and not heavy at all. I loved it, and at the end of the tall glass that seemed to go on forever, I loved everyone. We ended up spending several hours slowly sipping and enjoying the atmosphere, watching him pour perfectly for patrons who all seemed to be having the same glowing good time. 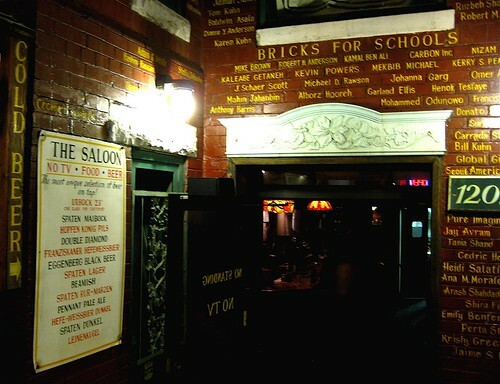 It’s impossible to go to The Saloon and not notice all of the names painted onto bricks both outside and inside, the slogan “Bricks For Schools” prominently displayed all over. It’s a testimony to their fundraising efforts that have helped build homes with Habitat for Humanity and schools in Central America. I believe they now have eight schools built, which is quite an accomplishment. They close for a few weeks each summer to continue the building mission. Ask Commy about it – his eyes light up and his dedication is infectious. People unwind at The Saloon, they strike up conversations with strangers, they relax. Usually they also end up expanding their beer knowledge and perhaps get inspired to give back to the community. Gosh, that pretty much sounds like the perfect pub. I’ve only been to The Saloon once after a night of heavy drinking. Their grilled ham & cheese sandwich hit the spot! I always forget about this place…will have to go back again soon. Kind of reminds me of the Brickskellar in Dupont Circle area. Except they claim they have a beer from every country in the world, but when you order it, it is sold out.